After a long, dark and cold winter, I welcome spring this year more than ever. We're not quite there yet in this part of the world, but when I woke up this morning to a bright and sunny day, I suddenly felt all happy and summery. And I wanted dinner that matched that feeling. This recipe fits that summery feeling very well. It's spicy and sweet, with the freshness of lime juice, the creaminess of the coconut and the kick of a drop of rum. Don't let the long list of ingredients fool you. It's easy to make, and it's a really sunny dish! In a foodprocessor puree the ginger, garlic, chili pepper and onion. Heat about a tablespoon of oil in a large skillet or wok, and fry the onion puree for a minute on high heat. Add the vegetables and the water and mix well. Turn the heat to low-medium and add the salt and the spices. Finaly, add the coconut milk, lime juice, raisins and rum and mix well. Turn heat to low and let it simmer for about twenty minutes, or until the sweet potato and carrots are soft (but not mushy) and the sauce has thickened a little. When the vegetables are almost cooked (after about fifteen minutes), heat a little oil in a skillet. Peel the banana, cut into slices and fry on high heat for a minute. Flip the slices and fry on medium heat for another minute or three, until the slices are caramelized and a little crispy on the outside. 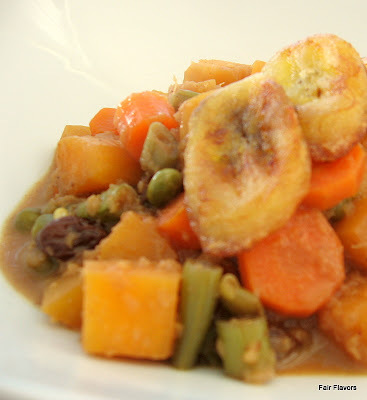 Serve the vegetables topped with the fried banana slices. We ate this over some brown rice and with a simple green salad on the side.